But then I was disappointed because the show was about humans. Hee Haw, as it turned out, was about these humans who lived in a ficticious rural place called Kornfield Kounty. But I gotta tell you that the show was really great. I think, if fact, it was about the place my Human grew up in. The episode was filmed in 1969, so she would have been 3 or so at the time. I didn't see her in the episode, however. So why do I think this show was great? Because the humans were so stupid. Incredibly stupid in fact. It was nice seeing humans in their natural habitat. There were a lot of stupid jokes and singing on the show. Not nearly enough dogs, however. I saw only one dog, a Bloodhound named Kingfish the Wonder Dog. He seemed to be snoozing. Nice work! What a thespian. I searched the world over and I thought I found true love. You met another and pfft you was gone. Your human grew up in such a place? How coincidental...so did the goatmother. I guess we can wallow together in commiseration. Our humom remembers that show - she says her little brofur really liked those korny jokes they told! Sadly, most humans do not want us to know how truly simple they are...My Mommy watched that show when she was a little girl...she was forced by her grandparents! How awful! But it seems all humans can trace their families back to such a place. Pray for the humans...they need it. PeeeSSS: I wuv woo Mommy! They just don't make shows and songs like that anymore! Mom said to tell you 'thanks for the earworm', Tubey. Ha roo roo roo! It's just as well you're able to keep an eye on the TV and keep up to date with this sort of news Tubey. Back when I was a kid, my parents would go out on dates a lot. 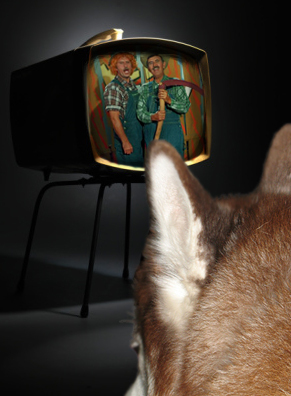 They'd always leave us in front of Hee Haw with t.v. dinners. My brother liked the salisbury steak. I always got the friend chicken with brownie. PS- we found a new mascot for your collection. It's on our blog today. Wow, flash back. And this human would have been 5 in 1969. 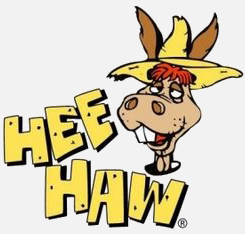 Since I live in the mountains at the North Carolina / Tennessee border, Hee Haw seems a little to real some days - chuckling. Funny - my verification word today was cousins. Not making any connections, but . . .
My Mom sez she useta watch that there HeeHaw show all theeee time and can still beller out that there tune you describe right there on yer there blog thing there.